Sad news in the music world; legendary R&B singer and Rock in Roll Hall of Fame inductee Marvin Junior of The Dells has passed away. Marvin Junior was the lead singer of The Dells. He was known for his powerful baritone that inspired the likes of Teddy Pendergrass and Gerald Levert. The Dells were an unstoppable force to be reckoned with thanks to his strong baritone with the combination of lead tenor Johnny Carter who usually sung in falsetto. Marvin Junior was born in Arkansas and raised in Harvey, IL right outside of Chicago. It would be a place where he would always call home. The move the Five Heart Beats was loosely based on The Dells with Marvin Junior providing vocals for the movie. 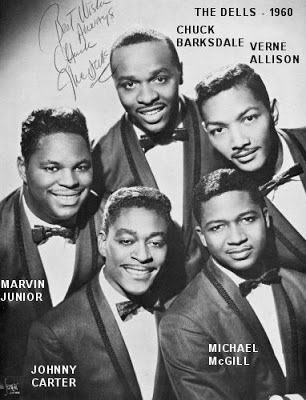 Thanks to the movie The Dells who had been recording successfully from the 1950’s would have one last major hit on R&B radio “A Heart is A House for Love” in 1991. Not only was Marvin Junior known for his booming baritone but also for his long notes. That long note in “Stay in My Corner” was a highlight and I find myself rewinding back to that part trying to mimic that note. It also became a highlight in The Dells live shows, where most times Marvin would hold it longer than the original recording sending the crowd into frenzy. If it was one song that defined the Dells entire musical history (which is impossible), it would have to be “Oh What a Nite”. The song was originally released in 1956 and re-released with a different arrangement in 1969 and topped the charts and this time much bigger than the original release. The 1969 version is ranked on Rolling stones list of Greatest Songs of all time History and it was written by Marvin Junior and Johnny Funches. Marvin Junior will be missed. The Fresh Music Page sends prayers to the Family & Friends of Marvin Junior.